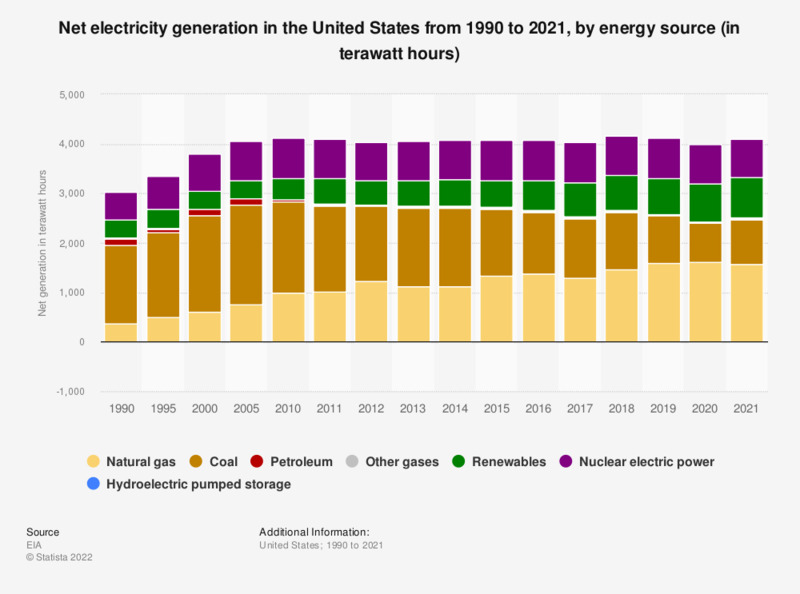 This statistic represents the total electricity net generation in the United States between 1990 and 2018, by source. Here, around 1,468 terawatt hours of electricity were generated from natural gas in 2018. * According to the source, coal figures include anthracite, bituminous coal, subbituminous coal, lignite, waste coal, and coal synfuel. Petroleum: fuel oil, residual fuel oil, petroleum coke, jet fuel, kerosene, other petroleum, and waste oil. Natural gas: natural gas, plus a small amount of supplemental gaseous fuels. Other gases: last furnace gas, propane gas, other manufactured and waste gases derived from fossil fuels. Hydroelectric pumped storage: pumped storage facility production minus energy used for pumping. ** Renewable energy figures have been added up. They include the following sources: hydroelectric conventional, biomass, geothermal, solar/PV, wind.